Judging from my recent posts, it has been a while since I have eaten at a place that lifted my spirits. Porto Romano recently did. I’ve been meaning to pay the restaurant a visit, but never got to it until last week. The two-storey outlet in Mon’t Kiara is located in front of the Mon’t Kiara Banyan condominium — I was half prepared to pay through my nose. The ambiance is swanky yet inviting, and the brick walls and wooden flooring gives the place a rustic charm. 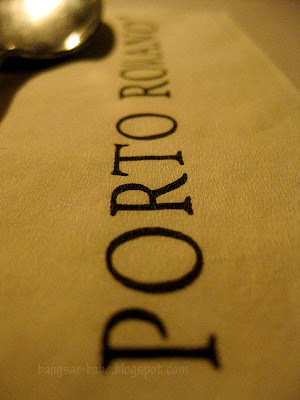 Porto Romano has the kind of menu that makes me wish for a cow’s stomach, so I could order everything on the menu and segregate it. We got the ball rolling with the spaghetti pesto (RM36), braised lamb shank (Stinco d’Agnello – RM38) and devil’s pizza (RM27). 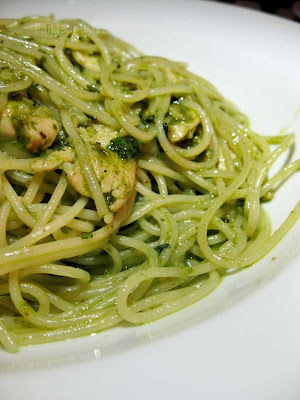 Pesto is made by grinding pine nuts, garlic and basil into a paste, which is then enriched with olive oil and Parmesan. The pasta was very fragrant, smooth and green. And it unleashed a suppressed lust in pesto, which I didn’t think I had. The pesto sauce packed a wallop of flavours, and had just the right amount of olive oil, for the ingredients to whirl and emulsify. Simple, yet deliciously addictive. 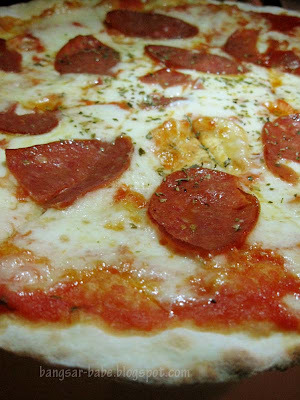 Devil’s Pizza is Porto Romano’s version of pepperoni pizza and it sounded promising. The pizza had a very thin, crisp crust, where it remained crusty and chewy at the border without being doughy. There was sufficient topping — fresh mozzarella cheese and spicy pepperoni, so the bottom of the pizza is entirely cooked through, and crisp rather than soggy. The only thing missing was the scent of wood smoke, usually present when a wood oven is used. 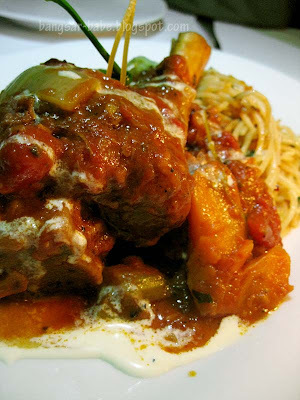 The Braised Lamb Shank (RM38) in chunky tomato sauce was terrific, with meat falling off the bone. Evidently braised for hours, the shank was tender and fragrant, making the dish hearty and complete. The rich flavour of the lamb was offset by the tangy, slightly spicy tomato sauce, while the accompanying pasta aglio olio was aromatic and flavourful. I liked their chilli sauce. It was wickedly spicy! This added plenty of punch to the pizza – not that that it needed any. 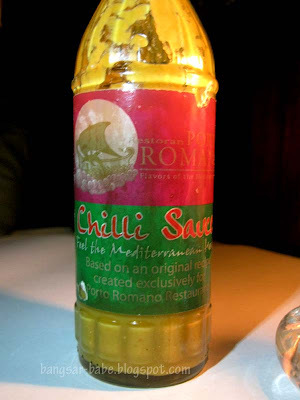 It tasted similar to the super hot peri-peri sauce in Nandos, only nicer. The dessert list was skimpy. We shared the tiramisù — the layers of sponge fingers drenched in coffee, with sweet cream filling had a perfect balance of sweet and bitter. The sponge fingers were soaked just enough to make the layers come together into a moist, creamy dessert. I was disappointed to find little or no alcohol in it. But to be fair, this was a rather good non-alcoholic tiramisu. 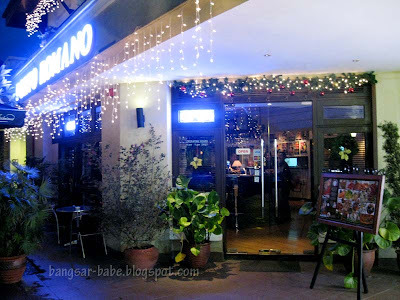 We really enjoyed the food and prices were reasonable despite its upscale location and decor. Service was alright, albeit slightly inconsistent — my request for a dish recommendation was replied with, “Errr…everything is nice”. Despite that minor problem, I’m determined to return and try more things on the menu. Verdict: Scrumptious food, decent portions and fair pricing. 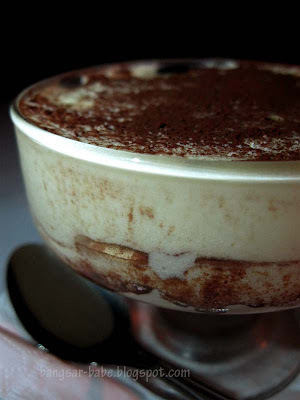 It was hard to fault the dishes I ordered, except the tiramisu which could do with a lot more alcohol. Oh man the Lamb Shank really looks good. Maybe should bring own Rum for tiramisu hehe. Looks like a nice place to be! so home feel! I do love this location… so isolated from all the din of F&B hubs like Hartamas and Solaris. Haha, that dish recommendation response is a TOTAL fail though!! Guess one should never ta-pau from this plc, but head there to eat instead! And i heart pesto too! woah…nice place with great food. i love the deco very much, nice post!!! 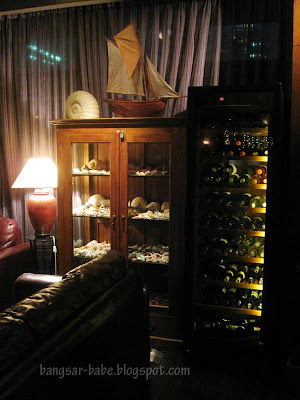 My Taste Heaven – Thanks! nomad – Ya…ta pau not so nice de. BBO – Good for dinner dates too! 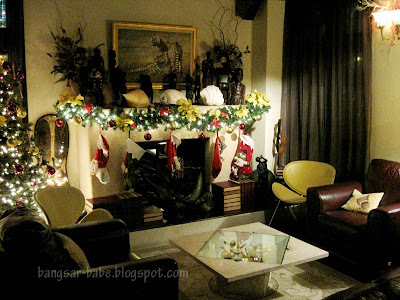 Christine – Yup yup..I like the decor. Go try la! Lisa – Ya…next time I'm bringing my own rum and asking them put 'kao kao'! try their squid ink pasta.. lovely..
i just had the squid ink pasta at the mont kiara branch. It was utterly dissapointing…the pasta was soggy and the flavour was overpowering the squink ink pasta. service was below par on a pretty quiet night. the waiters are not attentive and handled my wine poorly. Whats the point of paying corkage when you cant serve wine in proper glasses? the only plus point was the lamb shank..it was succulent and pretty good value at rm38..